Olympia is a town famous all over the world thanks to the fact that the idea of worldwide athletics started from that specific geographical place. The most important athletic events on the earth originate from the ancient town of Olympia where the idea of free men competing peacefully each other, respecting the rules of the game aiming at winning an olive crown, was born. Located in the west part of Peloponnese, between two rivers, Alfios and Cladeo, it extends in a totally tranquil and green scenery. It was full of plane trees and olive oil trees in the past and it was called "Altis" by its ancient inhabitants. This rich valley was chosen by them in order to settle their houses and construct a sanctuary devoted to the Father of the ancient Gods, Cronus, on the top of the imposing hill on the north part of the sacred town. On the roots of the hill they built sanctuaries devoted to female deities and a very old oracle, Ghaion, for the very first fortune-teller named Ge (Earth). Entering the ancient site, one can firstly see the remains of Hera's Temple which is as old as the Olympic Games. On the south, the Doric Style Zeus's Temple was erected in ancient Olympia, in the 5th century BC. It is the largest temple that had ever been built in Peloponnese and its size was similar to that of the Parthenon, Athens. Even though it had a rich decoration and it was made of marble that had been transferred from Paros island, the biggest part of the Temple does not exist anymore. The bases of the pillars and some pieces of pillars fallen on the ground are the only remains of that Temple which hosted the 12 meters tall chryselephantine statue of Zeus, one of the ancient world's wonders. The statue was created in 430 BC by the famous sculptor Pheidias whose workshop was housed in one of the nearby chambers of the sanctuary. The athletes used to swear that they will obey the rules of the games in front of Zeus's statue, before entering the stadium. Then they were directing to the stadium passing infront of a series of bronze made Zeus's statues. The construction of these statues had been paid by the athletes who had disobeyed any of the rules, so the name of that athlete, his father's name as well as his home town were written on each statue. 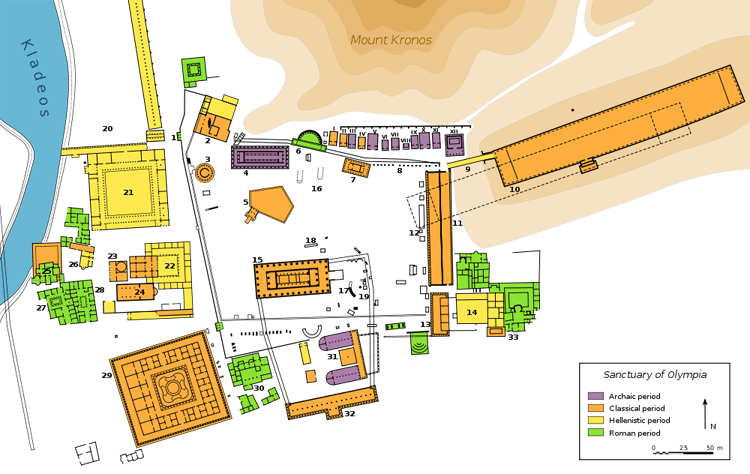 Moving southwest from Zeus's Temple, one can see the remains of the Leonidaion, the guest house where the VIP visitors were hosted during the Olympic Games. Some meters away, to the east, behind the Leonidaion, the Vouleftirion was built which served as a meeting point of the Games Council. 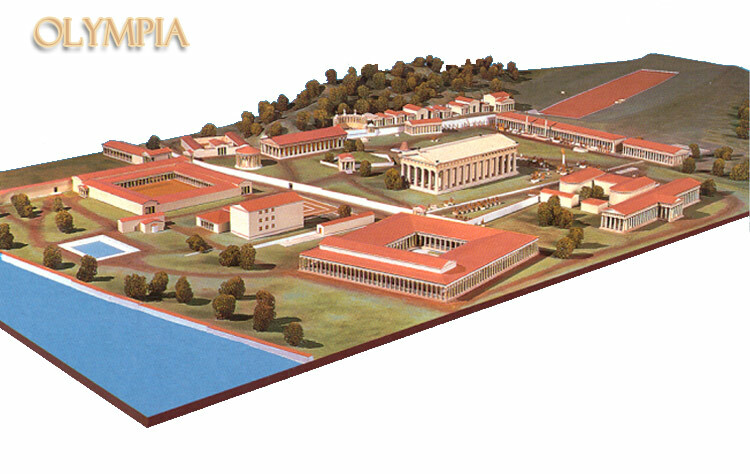 The findings discovered in ancient Olympia are presently hosted in the Archeological Museum, situated opposite the site. The museum house some important collections and its highlights are considered to be the pediments of Zeus's Temple which are exposed in the main chamber of the museum. 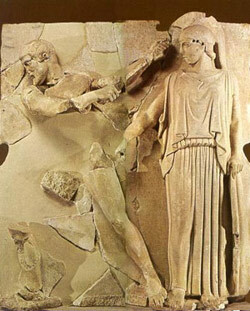 The famous statue of Praxiteles's Hermes as well as Nike Paionios [also known as Fteroti (Wingy) Nike] are also exposed in that museum. What is more, one could see the tools used by Pheidias and some of the tools the athletes used for the games. The first Olympic Games of the ancient world took place 3,000 years ago, in 776 BC and they had been being carried every 4 years, for more than 1,000 year. 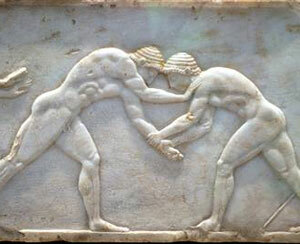 For the ancient Greeks, the Olympic Games had a very old ancient origin and was a part of their worship to their ancestors. Despite the fact that ancient Greeks used to live in separated tribes and in various geographical areas in Minor Asia, in Italy, in Africa and in Macedonia they were aware of their common origin and their national identity that makes then different than the rest people of the world. Only free greek people were allowed to take part in the Olympic Games and the peaceful co-existence of all the Greeks was necessary for the carrying out of the games. This meant that any war or fight should stop during the period of the Olympic Games and on that purpose the nobles from Heliea used to visit the greek towns, long in advance the games, in order to preach the truce. 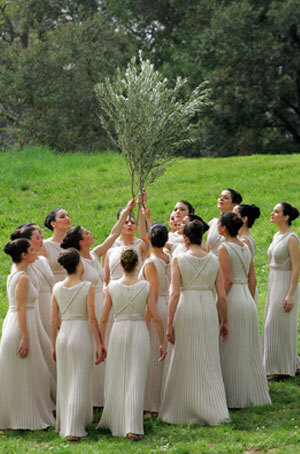 Hostilities ceasing used to last for 3 months so that all Greeks join the most important ceremony of the ancient world. Zeus was considered to watch the Olympic Games from his imposing Temple. The victors used to put their statues in his sanctuary, not showing off their strength but just paying honors to the God. Apart from its archeological value, Olympia as well as every part of Peloponnese has a magnificent natural beauty thanks to its high mountains, its vegetation and its coastal cities. A visit in Peloponnese can be rich in culture, attractive sceneries and breathtaking views. Olympia is visited by thousands of tourists annually who grasp the chance to explore a wider part of the surrounding area which is full of interesting sightseeing places. It is an area well organized for accepting foreigners and offering them high quality services. Hotels in Olympia offer mainly a great view to the mountains of Peloponnese and easy access to the beach and a lot of recreation areas. Just keep in mind that a visit to Peloponnese should last at least three days in order to see as much as possible of it while enjoying its unique Nature. The "Hermes of Praxiteles" is a worldwide known statue created by one of the greatest sculptors, Praxiteles, in the 4th century BC. Hermes is holding Dionysus who is an infant, born by Zeus and Semele. Zeus asked Hermes to protect Dionysus from Hera's Envy, so Hermes was transferring him to the Nymphs who would raise him secretly. 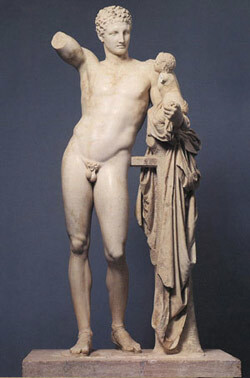 Praxiteles used to depict the beauty of the young bodies and he was looking always for delicate figures. The statue is 2.13 meters tall and it is made of marble from Paros island, just like Zeus's Temple. One of the great pediments from Zeus's Temple hosted in the Archeological Mueseum of Olympia. Athena is helping Hercules who is carrying out one of his twelve feats: cleaning Augean's stables.